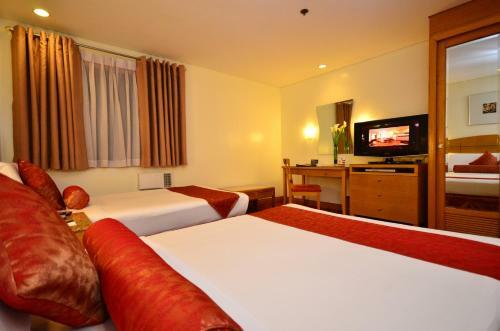 Booking your room with City Garden Suites in Manila, Philippines is simple. Check for latest rates, hotel details and pictures and reserve your hotel room online. City Garden Suites address is 1158 A. Mabini Street, Ermita, 1000 Manila, Philippines. City Garden Suites phone number is 25 361 451 to 59. Among City Garden Suites amenities we can list: 24hr room service, restaurant, laundry service / dry cleaning / ironing service, fitness center. Some of City Garden Suites room amenities are: satellite / cable TV, television, internet access, air conditioning, telephone, mini bar, internet access (wireless). Check above for more hotel and room facilities. City Garden Suites does offer car parking. Above you may also check City Garden Suites location on the Manila map and available touristic activities. Located in Manila’s vibrant Ermita district, City Suites is 700 metres from Robinsons Place Mall. A gym and massage services await guests. Free Wi-Fi and free private parking are provided. Promotional codes, voucher codes, discount codes are not required for City Garden Suites reservartions in Manila as all prices have already been applied all discount rates available. This, together with our hotel comparison rate service, will save you up to 75% on online hotel bookings. City Garden Suites was reviewed by 0 users and received a 0 /5 . 0 reviews on this hotel.